Dimitrios Kalemis | I am exactly like Jesus Christ: an atheist and anarchist against society and bad people with influence and power (judges, social workers, politicians, priests, and teachers). The Haselbauer-Dickheiser Test can be found at http://matrix67.com/iqtest/. In this blog post, I will study Question 6 from this test. The question is about physicists’ names as strings. Particularly, each alphabet letter is assigned a number and we have to find which number each letter has assigned to it, given the sums of strings, where each string is the surname of a famous physicist. Please do not read the rest of this article, if you want to attempt to solve this question on your own. The rest of this article describes my attempt at solving this question and you should not read it, unless you want to or you do not mind coming across relevant ideas, spoilers, hints, solutions, and strong opinions concerning this test. You have been warned and I now consider that you continue to read knowing that what you come across for the rest of this article may forever spoil things for you and/or present strong opinions against this test. Last warning: please do not read this blog post, unless you are certain that you know what you are doing. If you are not sure, then it would be best if you stopped reading at this point. OK. If you are here, it means that you want to know my opinion. Well, ok then! To cut a long story short, my opinion is that the test is highly inappropriate. In this blog post, I will focus on the study of question 6. I have not solved this question, but I promise you, dear reader, that if you bare with me, I will make this blog post worthwhile for you to read and I will provide interesting information about this question. This is a question that is really hideous and I am against it. It is a very inappropriate question. The question makes you think that you need to solve a system of linear equations and this is true to some extent. But if you look carefully, FEYNMAN has the letter Y in his name, and the letter Y does not appear anywhere else in the names given. What is worse, the same happens for the letters J, Q, X. Thus, four letters (J,Q,X,Y) do not appear in the 25 names for which we are given the sum of the letters that comprise them. So, the question is about finding the value of each letter, but the value cannot be solely derived from the sums. We also have to guess. And this is what makes this question inappropriate. Please note that the letters j, q, x, y are missing. Below I present the above image in text form, in case you need to copy it. Below you can see how I used Excel to check the validity of the results. The results are correct. The value for FEYNMAN is calculated by setting Y=0, since we do not obtain its value from solving the system of linear equations. 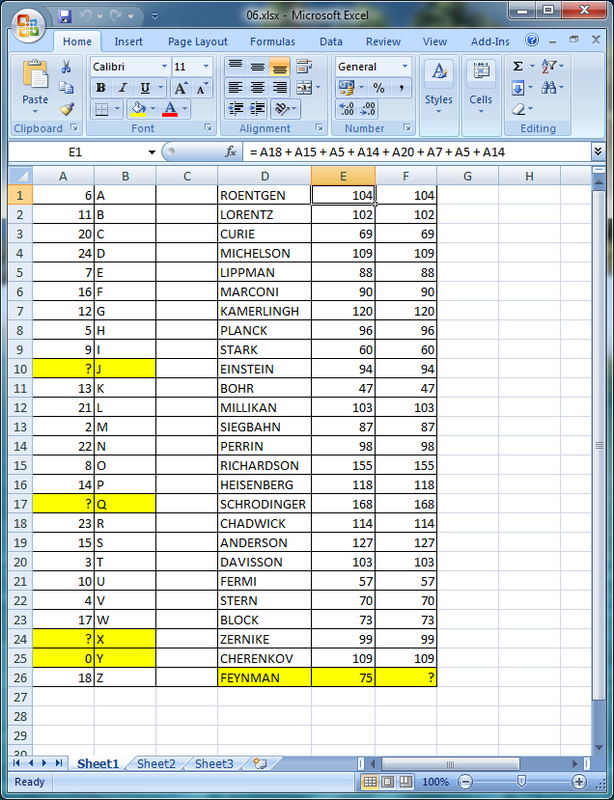 Below you can see the results listed in Excel, first sorted by letter and then sorted by number. Below are the same results, in text form, should you need to copy them.
? M T V H A E O I U B G K P S F W Z ? C L N R D ? ? We can see that solving the system of linera equations gives us the values of 22 letters of the alphabet, and we miss the values for the letters j, q, x, y. If we assume that each letter is assigned a different value from 1 to 26, then the missing numbers are 1, 19, 25, 26. The previous assumption, that each latter is assigned a different value from 1 to 26, should be valid. But what are the values of the missing letters j,q,x,y? Which is 1, which is 19, which is 25 and which is 26? I do not know. We have to guess. We can either consider the pattern of the letters (sorted by their corresponding number) ? M T V H A E O I U B G K P S F W Z ? C L N R D ? ?, the pattern of the numbers (sorted by their corresponding letter) 6 11 20 24 07 16 12 05 09 ? 13 21 02 22 08 14 ? 23 15 03 10 04 17 ? ? 18, or the relationship between each letter and its corrsesponding number. Any pattern that might be found, might be the pattern that was used for the assignments. Another psossibility might be that a clever hash function was used, a function that provides a rearrangement of the numbers from 1 to 26. Anything goes. But to assume is not a mature thing to ask from someone. Actually, I believe that most people who solved this question gamed the system. They did not really find the pattern of number assignment and instead tried all four possibilities, one by one, to see which one the system accepted as correct. And if they were ever asked how come they proposed their solution, they would just say the truth, or they would just provide a tongue-in-cheek answer that they would know that it would be deemed incorrect. Y=1 => FEYNMAN = 75 + 1 = 76. Y=19 => FEYNMAN = 75 + 19 = 94. Y=25 => FEYNMAN = 75 + 25 = 100. Y=26 => FEYNMAN = 75 + 26 = 101. I believe that the whole point of this question is for us to find the pattern that was used for the assigment of numbers to the alphabet letters. This is why I skimmed throught the solution of the system of linear equations. Indeed one may spend time and reduce the system of the 25 equations to smaller systems and find clever ways to solve it. Or one may solve it manually. Or one may create a program that solves it. But this is not what the question is about. The question is about guessing the value of the letter Y after we have found the values of the 22 letters. And, to me, this is an inappropriate thing to ask. In this blog post, I will study Question 15 from this test. 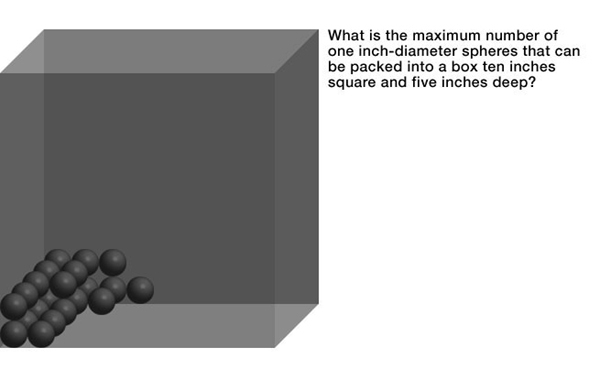 The question is about packing spheres in a rectangular box. To cut a long story short, my opinion is that the test is highly inappropriate. In this blog post, I will focus on the study of question 15. In my previous blog post, I promised that this blog post would be about this question. This is because both the question I examined in the previous blog post and the question I examine in this blog post are asked and answer in the same book and the same chapter. And their answers are given on the same page! Imagine that! The authors of this test appear to be completely deranged! 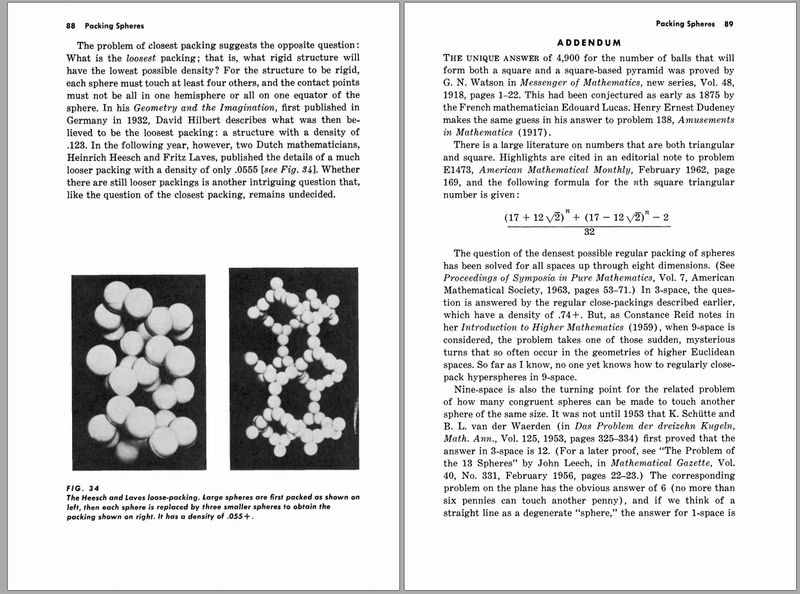 The whole chapter is fascinating, but before I discuss the question further, I would like to draw attention to page 86, right after the question is posed, where Martin Gardner answers a very interesting question: how come honeycombs are hexagonal. Ok, back to the question at hand. 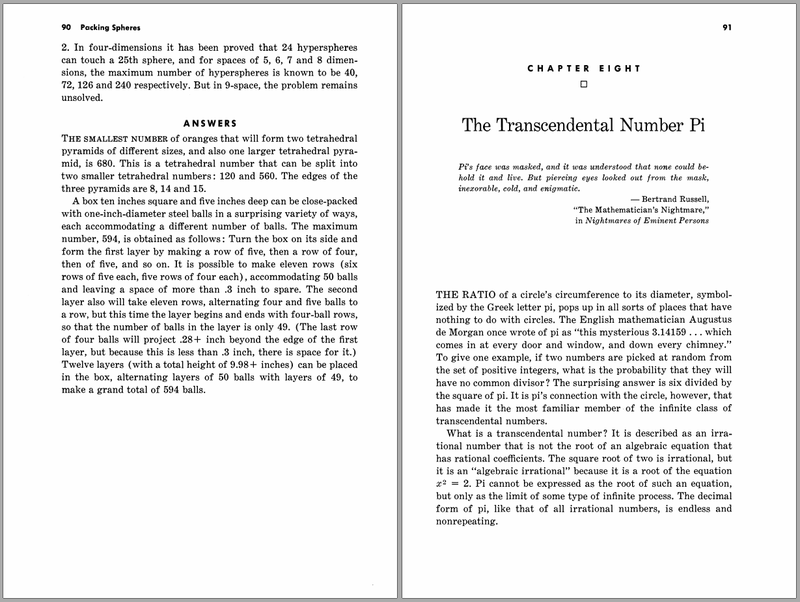 The answer is that the maximum number of spheres is 594 and Martin Gardner provides this answer and the explanation on page 90. The explanation Martin Gardner provides is extremely brief, to the point of it being difficult to be understood. In the rest of this blog post, I would like to make this answer a little more understandable. Turn the box on its side and form the first layer by making a row of five, then a row of four, then of five, and so on. It is possible to make eleven rows (six rows of five each, five rows of four each), accommodating 50 balls and leaving a space of more than .3 inch to spare. The second layer also will take eleven rows, alternating four and five balls to a row, but this time the layer begins and ends with four-ball rows so that the number of balls in the layer is only 49. 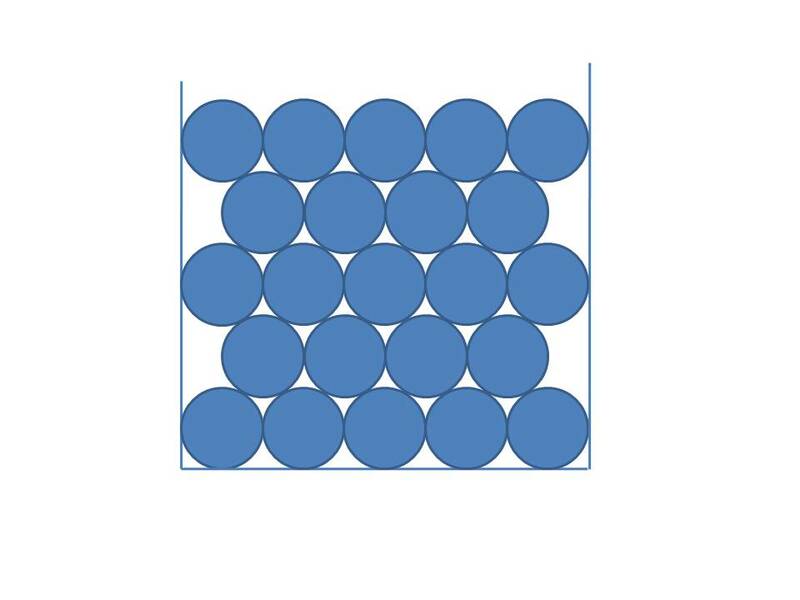 Twelve layers (with a total height of 9.98+ inches) can be placed in the box, alternating layers of 50 balls with layers of 49, to make a grand total of 594 balls. The above answer is provided by *the* man Martin Gardner, and I use bold italic font for this. I took the liberty to divide the answer in paragraphs. 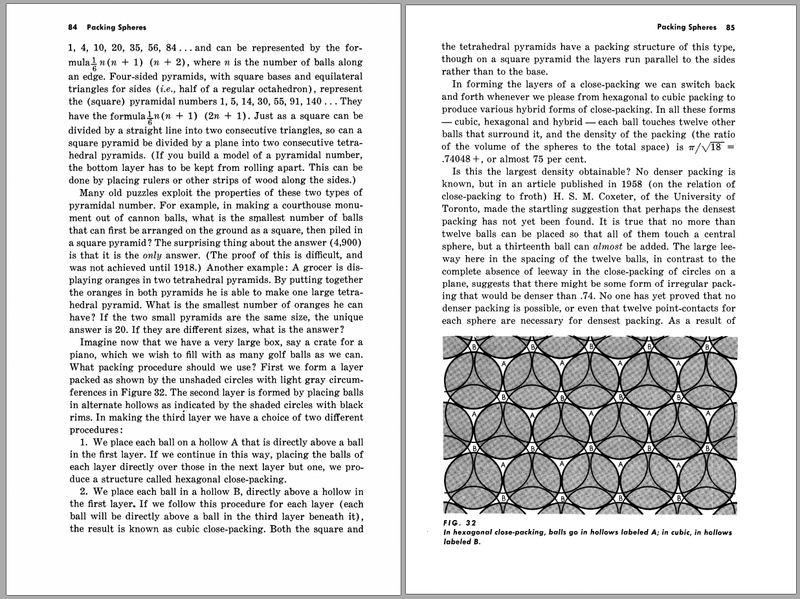 The first two paragraphs talk about the first layer of spheres, the second two paragraphs talk about the second layer of spheres and the fifth and last paragraph talk about all layers of spheres. Below, I will divide the answer into these three steps: studying the first layer, then the second layer, then all layers. So, let me begin. All lengths below are in inches. I will use the Pythagorean theorem and the fact that when two spheres touch, the line segment that connects their centers and is the distance between their centers is equal to the sum of their radii. And since we are dealing with spheres of the same radius, when two spheres touch, their distance is twice their radius. I will first study the first layer. We have the box sitting flat on a horizontal table and the box’s dimensions are length=10, width = 5 and height = 10. So the height is one of the two large edges. In the following image, I put some spheres, not all, only the first five rows. The image depicts the first layer, as we look down from above. In the following image, which is the same as the image above, I calculate the distance between two rows of spheres. The distance is the red vertical line segment. 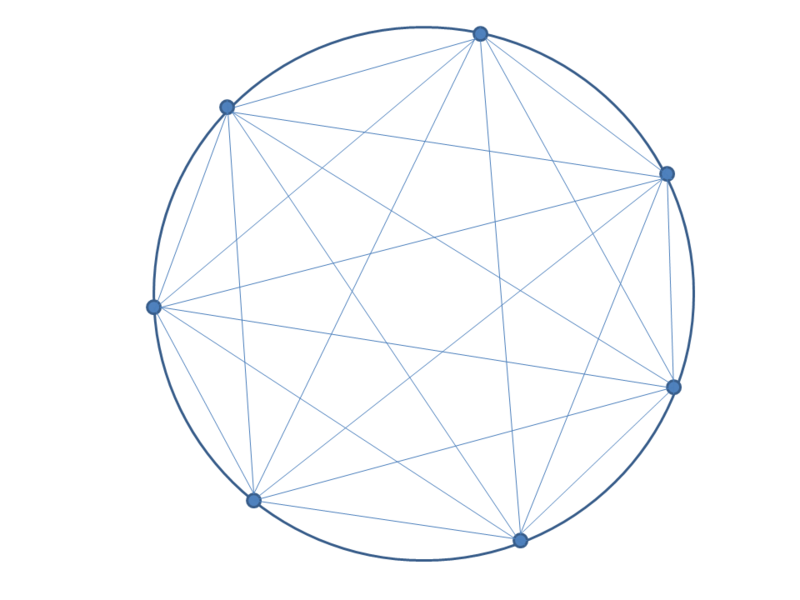 Each dotted line passes through the centers of the spheres in a row, so the red vertical line segment is indeed the distance between two consecutive rows. As far as the previous table is concerned, in the first column I denote lengths and in the second column I denote number of spheres in a row. Red color denotes a sum. 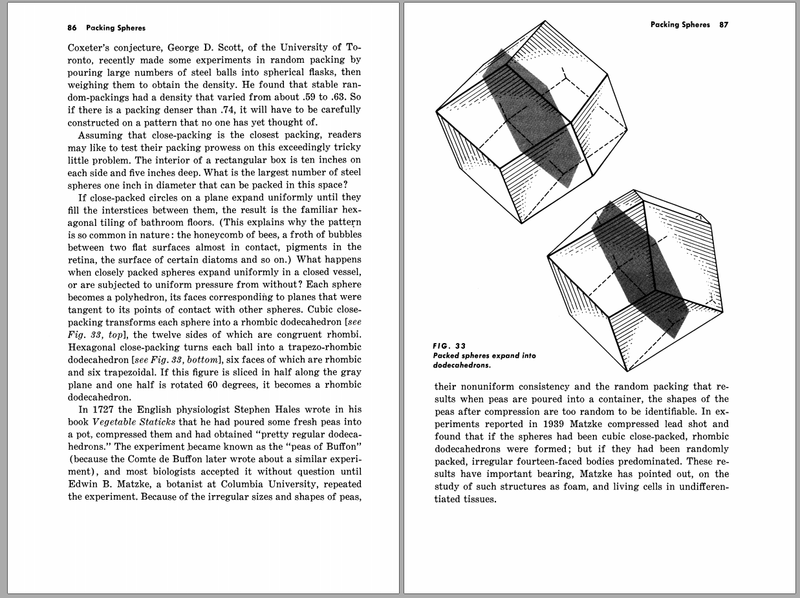 Martin Gardner was describing the arrangement of the first layer as we look down on the box from above and I just explained these two paragraphs of Martin Gardner’s text. Moving on, I will now study the second layer as we look down from above. The following image presents the layout of the second layer of spheres as we look down from above. I will now superimpose the second layer on top of the first layer, thus producing the following image. In the image above, the first layer is depicted containing blue spheres and the second layer is depicted containing white translucent spheres. So, the white translucent spheres are above the blue spheres and we are looking from above the white translucent spheres. To calculate distances, I made the following image. In this image, we have three blue spheres from the first layer and a red sphere from the second layer. I changed the color of the second layer sphere from white translucent to red, so it is easier to see. Here, I want to calculate the horizontal displacement that the center of the second layer sphere has in relation to the center of the first row of spheres from the first layer. 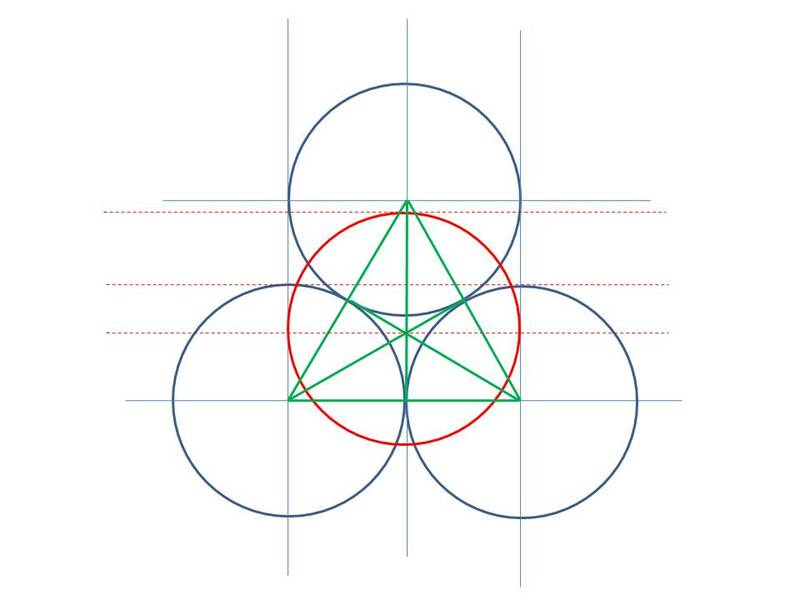 This can be found from the green equilateral triangle formed by the centers of the three spheres on the first layer. The barycenter of this equilateral triangle is exactly below the center of the red sphere from the second layer. Thus, the displacement I am looking for is the distance of this barycenter from a side of this equilateral triangle. 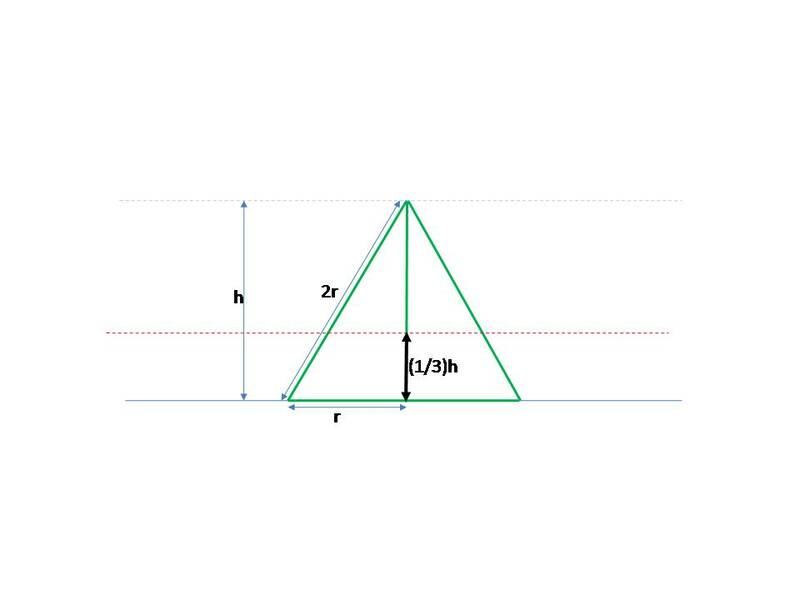 If I denote h as one of the heights of the equilateral triangle (all three height being equal in an an equilateral triangle), then the distance of the barycenter (the point where all three heights meet) from one of the sides is (1/3)h.
From the right triangle that is formed from one of the edges of the green equilateral triangle and one of its heights, we can calculate this displacement. (1/3/)h = 0,2887, almost equal to 0,289. So I have explained the first two layers, and I can now talk about all layers. To do this, I need to calculate the vertical displacement that the second layer has in relation to the first layer, i.e. how much higher are the centers of the spheres of the second layer in relation to the centers of the first layer. Up until now, we were looking the structure from above and we studied horizontal geometrical shapes and horizontal projections. Now we will need to think vertically. We will need to look the box from the side. 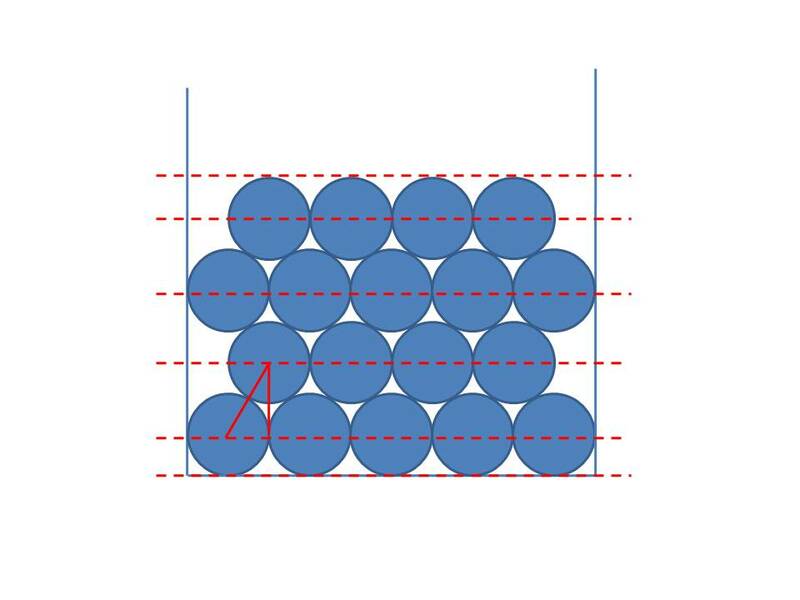 But this time, imagine that we do not want to look this arrangement from above, but we want to look at it from the side, in order to find how much is the center of the red sphere on the second layer is elevated in relation to the centers of the blue spheres of the first layer. This elevation, this vertical distance, let’s call x. 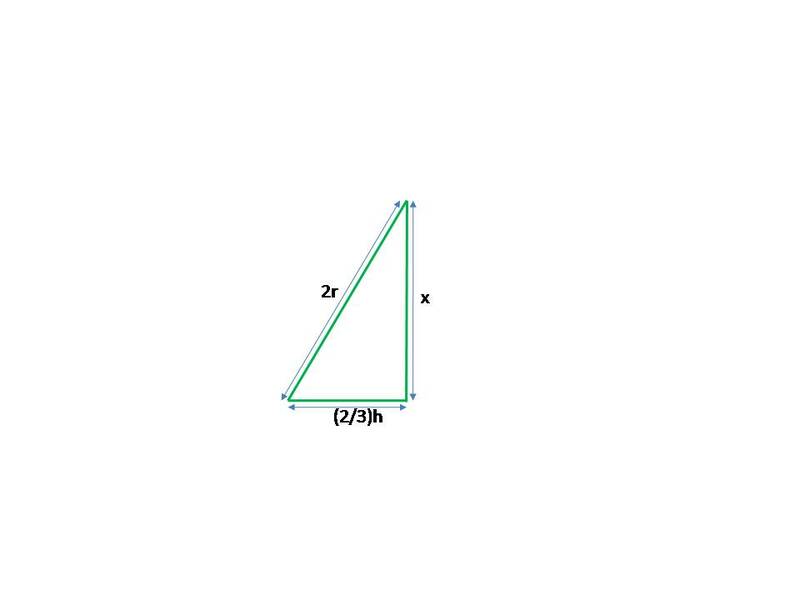 We can find x from the following right triangle. This right triangle is formed as follows: The side with length 2r is formed by the center of one of the spheres of the first layer and one of the spheres of the second layer. The side with length x is completely perpendicular. And the side with length (2/3)h is completely horizontal. Imagine that this is a triangle that we can see when we look at the arrangement in the image before that, from the side. But from the discussion about the second layer, we know that h^2 = 3r^2. Now, if you see at the image provided with the question, the spheres are arranged in a cubic manner, and this in no way will provide the maximum packing. This manner will provide a 5*10*10=500 spheres as the number of spheres that can fit in the box. The authors of the test are setting us up to fail. This is the behavior of a very bad person. So I am asking: Would you want to be friends and belong to a group of people whose mentality is to judge people on their intelligence instead of their character, and that keep knowledge hidden, and that set others for failure? In this blog post, I will study Question 4 from this test. 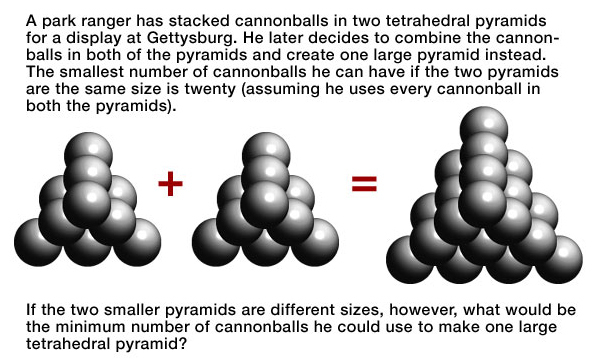 The question is about spheres stacked up to create tetrahedral pyramids. To cut a long story short, my opinion is that the test is highly inappropriate. In this blog post, I will focus on the study of question 4. This question is great, if you plan to submit it to an elementary school student. But for a test for high intelligence, it is ridiculous. Not only that, but this question (question 4) and another question from the test concerning spheres (question 15) are asked and answered in Martin Gardner’s book titled “New Mathematical Diversions”. 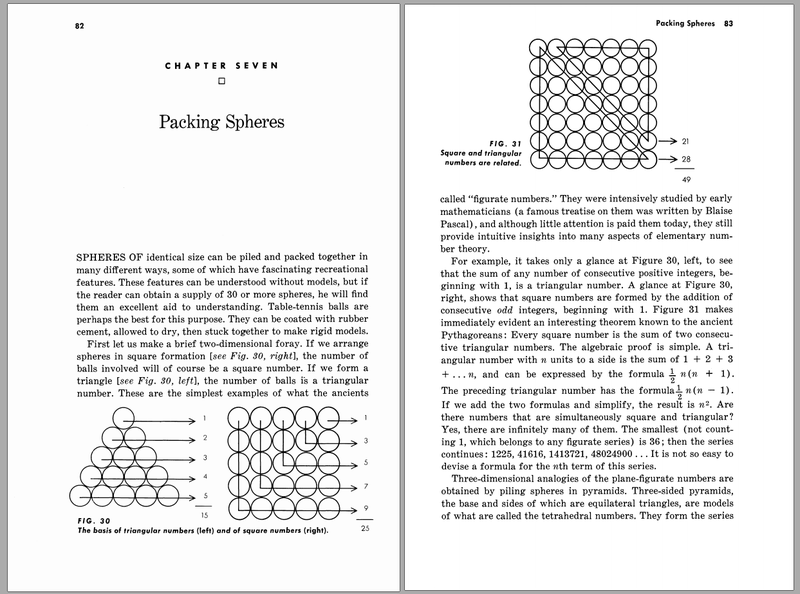 These are not the only questions that are blatantly copied word for word from Martin Gardner’s books, but here the situation becomes extreme: Two questions, from the same book and also … wait for it… from the same chapter: chapter 7, titled “Packing Spheres”. What more can I say? All I can ask is: Are the people who created this test completely deranged? 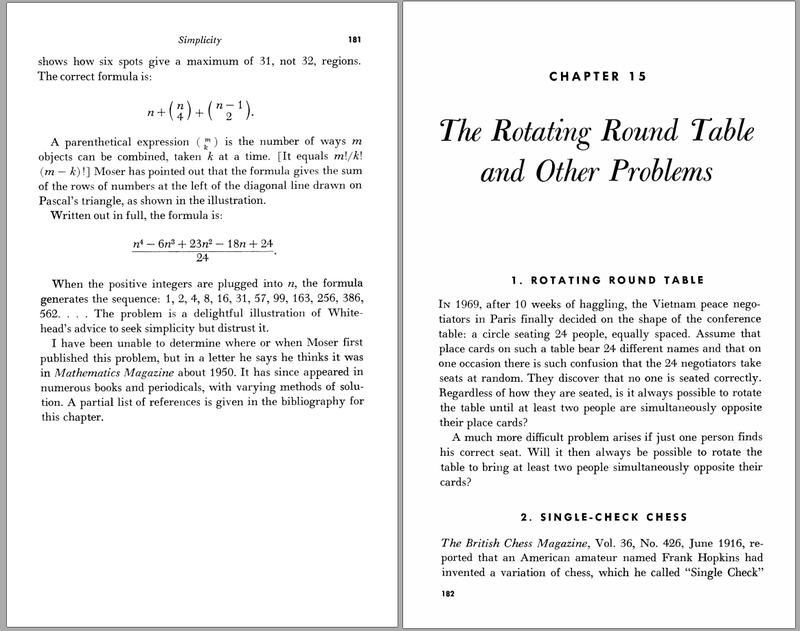 Before I present the answer I came up for this question, I would like to present the pages from Martin Gardner’s book where this question and the corresponding answer are mentioned. I promise that my next blog post will be about the other question from the test that is asked and answered in the same chapter. And yes, underneath the answer for this question, the answer for the other question is also found. One page, page 90, contains the answers to two questions from the test. And, yes, the creators of the test want to preserve the integrity of the test. And yes, all the above make no sense at all. I will now present an answer to this question, by thinking as an elementary school student would. With simple thinking and the use of Excel, I found the answer in a few minutes. I opened Excel. I created three columns with numbers. The first column had the natural numbers 1, 2, 3, … that denote the layer of a tetrahedral pyramid starting from the top. The second column had the number of spheres that comprise the layer. This number is equal to n(n+1)/2, where n is the number of the layer. The third column is the running total of the second column, thus it is the number of spheres of the layer and all the layers above it. Thus , the third column depicts the total number of spheres that a tetrahedral pyramid contains. Now, the problem we want to solve is to take the numbers from the third column and, from these numbers, find the minimum number that is the sum of two others. In order to do that, I put the numbers in a horizontal line and in a vertical line, thus forming a square. For each pair of numbers, I had Excel calculate their sum. 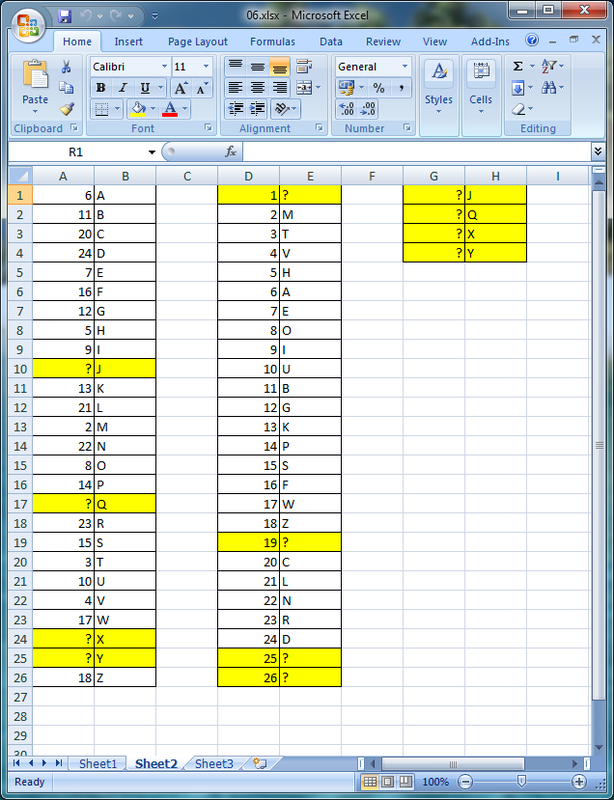 Then, all that was left to do, was to search in these sums to find a number from the third column. I needed to only search either above or below the diagonal, since the sums below the diagonal are the same as those above the diagonal. Searching is easy because the value of the numbers is increasing from top to bottom and from left to right. So, I found that the answer is 680. A tetrahedral pyramid with 8 layers contains 120 spheres. A tetrahedral pyramid with 14 layers contains 560 spheres. A tetrahedral pyramid with 15 layers contains 680 spheres. 120+560=680 and 680 is the smallest number for which this occurs. That is, for which the sum of the spheres of two different tetrahedral pyramids is equal to the number of spheres of another tetrahedral pyramid. In this blog post, I will study Question 8 from this test. The question is about discovering a pattern among line segments. There are many crossings among these line segments and each crossing is made by only two line segments. To cut a long story short, my opinion is that the test is highly inappropriate. In this blog post, I will focus on the study of question 8. I do not know the answer to this question, but I promise you, dear reader, that if you continue reading the rest of this blog post, I will make every effort to make it useful to you. First of all, I will make a brief discussion about the question. The question wants us to find the pattern behind the letter sequence that stems from the image. It is the same as the person who posed the question is asking us to find what she is thinking. “What am I thinking?” This question may come from a child, since a child is immature. It may also come from a mentally retarded person. It may also come from a person who has the incorrect impression that intelligence can be measured and that people that happened to be good at guessing are intelligent. It may also come from sociopaths. Knowing and not revealing may be a good indication of a sociopath. How can we handle such a question? First of all, we should not be handling it. It is not a proper question. It is not a valid question. It is a question a child would ask because of her immaturity. I always say to my students that there are no stupid questions, that any honest question is valid, has merit and deserves to be answered honestly. I say this to my students because no student ever asked me: “What am I thinking?” If a student ever asked me this question, I would certainly tell her that she is being silly. This question wants us to find the reason behind the letter sequence and the reason stems from the image. The image depicts line segments. Not lines, but line segments. They each have a name, each is named by a different letter of the alphabet from A to Q. And there are a lot of crossings, each crossing by two of the segments. No three or more segments cross at a point. The closed areas that are formed are painted and I think that this is very important. This is done in order to exclude line segment L from the sequence. Let me explain this important point. As you can see, line segment L crosses line segment J, but no closed area is defined there, thus no color is applied. This is the clue that denotes that we should not take this line segment under consideration and that our attention should instead focus on the colored areas. But I am not expressing it correctly. What I am really trying to say is this: The pattern that is given to us is Q P O N M. So, these are the letters backwards. So we would continue the sequence as follows: Q P O N M L K J. And this would be correct, because we would think that all line segments participate in the image, and the simplest explanation is that we take the letters in reverse order. Occam’s razor. We will accept the simplest explanation. But here, line segment L is obviously the odd one out. It creates a crossing that does not correspond to a painted area. And this is shown in a very conspicuous way. Thus, the creator of the question definitely wants us to steer away from choosing L as the next line segment. It is important to point out that the simplest explanation that takes all evidence into account is the best explanation. Thus, if we find two models that explain all evidence, then we should choose the simplest one. But of course, we must not discard any evidence. So, the alphabet letters in reverse order is too simple a model and does not encompass all evidence from the image. So, we should discard it. Let us see if we can find other models that account for all evidence. If we can, then the simplest ones should be candidates for the solution. Oh, and I have to stress another important point. The pattern we find has to produce a sequence starting with Q P O N M and it has to do it in a unique manner for any member of the sequence. It has to be unambiguous what each member in the sequence should be, starting from Q and going all the way to the last member of the sequence. 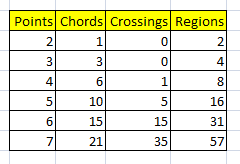 Let me begin by counting the number of crossings that each line segment makes. Below I present the same sequence, sorted from the most crossings to the least crossings and with a secondary sort of reverse alphabetic order. 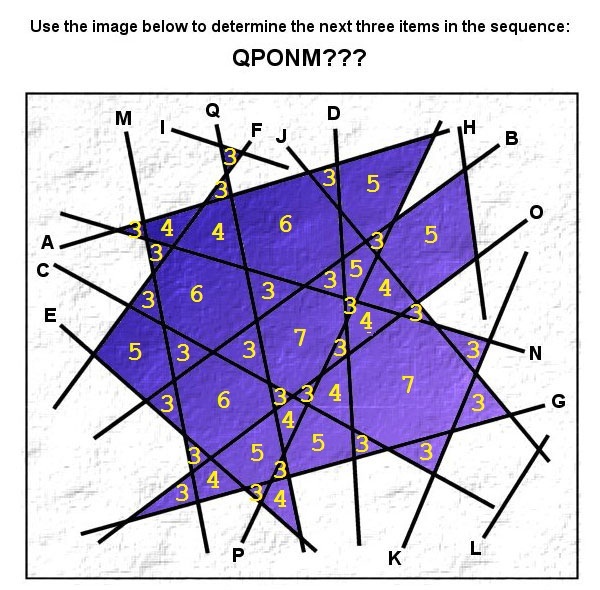 If we take the even numbers from the above sequence, we have the following sequence: Q P O N M J D K.
Let us see if we can find any other pattern that produces a sequence beginning with Q P O N M and unambiguously defines each member of the sequence up to the last. We start from the last alphabet letter that exists: Q. What line segments does Q cross? We can find them easily and we can order the alphabetically and we can take the last one. It is P.
Now we take P. What line segments does P cross? We order them alphabetically and take the last one not already in the sequence. It is O. Now we take O. What line segments does O cross? We order them alphabetically and take the last one not already in the sequence. It is N.
Now we take N. What line segments does N cross? We order them alphabetically and take the last one not already in the sequence. It is M.
Now we take M. What line segments does M cross? We order them alphabetically and take the last one not already in the sequence. It is G.
Now we take G. What line segments does G cross? We order them alphabetically and take the last one not already in the sequence. It is K.
Now we take K. What line segments does K cross? We order them alphabetically and take the last one not already in the sequence. It is J. So the sequence produced is Q P O N M G K J.
Ok, we found two different and simple patterns that produce an unambiguous sequence. The first pattern sorts the line segments by decreasing number of crossings, then in reverse alphabetical order and discards the odd numbers. The second pattern begins from the last letter assigned and for each line segment takes the biggest letter whose line segment it crosses. Which of these two patterns is the simplest? It is subjective. Is there a simpler pattern that requires even less creativity from our part? Hard to say. Here is another pattern: Let us begin from Q. Again we will find the line segments that Q crosses. We will order them alphabetically and will take the last two and list them in reverse alphabetical order. So from Q we get P O. Then we take O. We find the line segments that it crosses and are not yet part of the sequence, we order them alphabetically and take the last two. So from O we get N M. And so on. So, this is another pattern that produces Q P O N M unambiguously and can continue to produce unambiguous members of the sequence. And other patterns such as the above can be found. And I stress the fact that they can produce the sequence members in an unambiguous manner. But since they are more elaborate, more creative and more complex, we should discard them. The same goes for taking into consideration the number of areas attached to each line segment or the corners of the areas attached to each line segment. They are quite complex and do not correspond well to the sequence Q P O N M. But, if you want to try for yourself, below I present an image depicting the number of edges for each one of the areas. Since there are already many simpler models producing the pattern Q P O N M in an unambiguous and unique manner, I believe that the image above should be of no help to you, but I provide it in case you want to study it. Update January 1st, 2019: Some people who read this blog post, understood it incorrectly. When I say that I have not solved this question, I am being polite. Or rather, with this blog post, I proved that the question is subjective, and thus, incorrect. In this blog post, I revealed and provided answers and contradictions from the research I did. Please do not mistake my politeness for inability. In this blog post, I will study Question 17 from this test. The question is about cube nets covering an area. To cut a long story short, my opinion is that the test is highly inappropriate. In this blog post, I will focus on the study of question 17. This question shows most everything that is wrong and bad about the whole test. I do not know where to begin. Honestly. Ok, I guess I will have to begin from somewhere. Any start I think of choosing, I can find a worst one. So I guess I will start from the first thing that comes to my mind: discrimination and unfair advantage. This question about cube nets. Hexominoes and cube nets as their subsets are know to elementary school children in the USA. But not in Greece. Here, a child will be lucky if she only encounters and learns about one of the cube nets. But in the USA, children learn about the 11 kinds of cubes nets. They are even given all kinds of hexominoes and asked to discern which ones are cube nets. A child in Greece, nay, any person in Greece has absolutely no notion of what I am writing about. So, how come do I know these things? Well, I am not like other Greeks. Although I was born and raised in Greece, my culture resembles that of an American. Blame it on TV and radio. Blame it on all the scientific books in English I have read throughout my life. Blame it on me having interests way different that other Greeks. Well, blame it on anything you want, my culture has nothing to do with a usual Greek person’s culture. I have listened to the great radio programs from AFRTS one too many times. I have watched American movies and TV series one too many times. I have read American text books one too many times. So, the point I am trying to make is that any normal but also highly intelligent Greek would not understand what this question is about and/or be at a great disadvantage compared to an American. Another thing that really bothers me is that this question allows you to cheat. The grid has 96 squares. Each cube net has 6 squares. 16 X 6 = 96. So, the least amount of cube nets that would cover the grid with no overlap is 16. So, it is probable that the answer is 16 cube nets. If not, then the test taker can start adding one more to the answer, until she finds the correct answer. In hindsight, and as I will show in the last part of this blog post, the answer is indeed 16, meaning that the grid can be covered with cube nets with no overlap among them. This really bothers me because one may go ahead and guess that the answer is 16. Is is easy to guess that. Coming up with a configuration that achieves it is a little bit harder. But the test does not demand an actual solution, an actual configuration. It just demands the number. This is unacceptable to me. And, in any event, I cannot consider this question and the corresponding answer as indicators of high intelligence. All they are is a fun way to spent an afternoon. And this is something that unfortunately I cannot say for the rest of the questions of this test, because most of them I consider boring and tedious. In these series of bog posts, I want to prove that this test is detrimental to people and mankind, but I am faced with boredom, since for many of the questions, although I know how to solve them, I find it tedious to get involved with them. I have always been honest with you, dear reader, and I am not willing to change that. So, in all honesty, if I had a girlfriend, I would not have gone to the trouble of solving the questions. I would have devoted my time to said girlfriend. But since I have spare time, I do this, in case you find it helpful. And still, each time I try to tackle a question, I say to myself that this is stupid and pointless and there are way better and more sensible problems I can solve in my spare time. As for this problem, I previously said that it is a fun way to spent an afternoon. Well, yes but for toddlers. Mental note: Next time toddles are in the house, (toddlers are frequently here, children of friends and neighbors) I would give this puzzle to them to solve it. And some others puzzles from this test. Because, honestly, I am grown person and I should not be involved in this nonsense. Am I certain that some of these questions may pass as legitimate to a child. But if I tell them that this is test that measures high intelligence, I know what they would tell me. I have been around long enough with toddlers to know their come back answer. If I tell them that this is test that measures high intelligence, they will tell me: “I don’t believe you.” And the last thing you want is to lose your credibility with toddlers. They are harsh and unforgiving judges. For your convenience, I present a drawing containing the 11 cube nets. The question wants us to use these to cover the grid given. 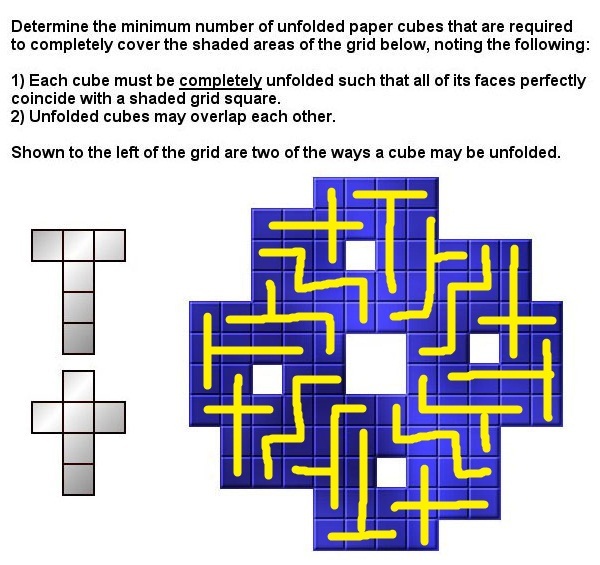 We are not allowed to place a cube net that is partly outside the grid, and the word “outside” includes the white squares that are inside the grid. The cube nets must not cover any part of those as well. 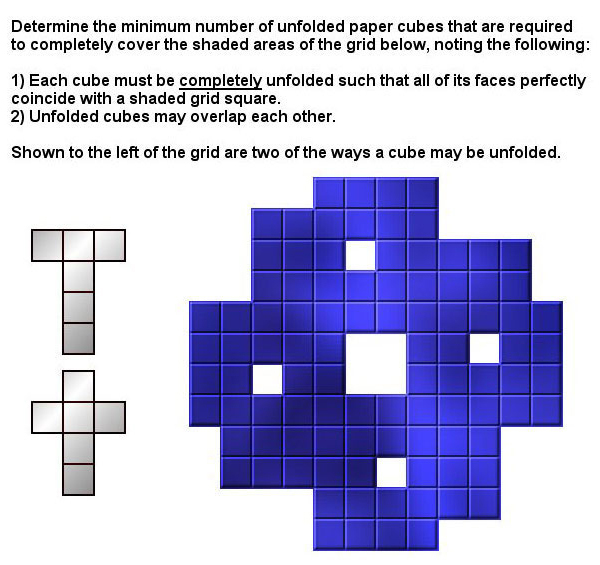 Each cube net must cover blue squares of the grid and only them. And we want to cover the grid with the least amount of cube nets. 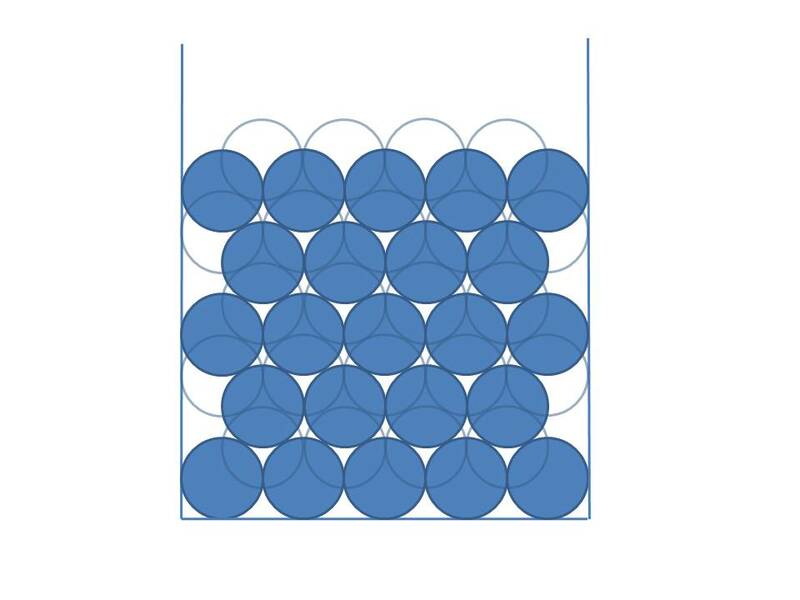 If we can achieve no overlap among the placement of the cube nets, then this is the configuration with the least amount of cube nets. And yes, we can achieve such a configuration. And since there are 96 squares in the grid and each cube net has 6 squares, a total if 16 cube nets cover the grid and it is the least number of cube nets that can achieve this. No, it is not some satanic drawing of symbols, I just opened the grid in Paint and started drawing cube nets with a yellow color line. I noticed that the grid has a 4-way symmetry. So, if I was able to fill one side with 4 cube nets, then the other 3 sides would be exactly the same. So, I had to find a configuration 0f 4 cube nets which would fit with itself in its adjacent areas, in its borders. So, what I did is that started placing two cube nets on a side and I would do the exact same arrangement in the other 3 sides. Then I had to be extremely careful so that the third cube net would be such is such a way that it allowed the fourth cube net to cover exactly the remaining space. This was easier said than done, bit I finally came up with the above configuration. I hope you notice the 4-way symmetry. To help you, you can imagine any four cube nets in series. When you repeat this series, each time rotating it 90 degrees, you will fill the entire grid. Each of the four sides of the grid is filled in exactly the same way and with exactly the same cube nets in exactly the same arrangement. One last thing I would like to point out about unfair advantages is that although I solved this problem with just thinking about it, there are people who are involved with hexomino tiling as scientific research. And computer programs also exist that allow you to specify a grid with forbidden areas and to specify which hexominoes to use then and perform the tilling of the grid for you. Test takers with such knowledge and/or programs are at a huge advantage over other test takers. In this blog post, I will study Question 11 from this test. 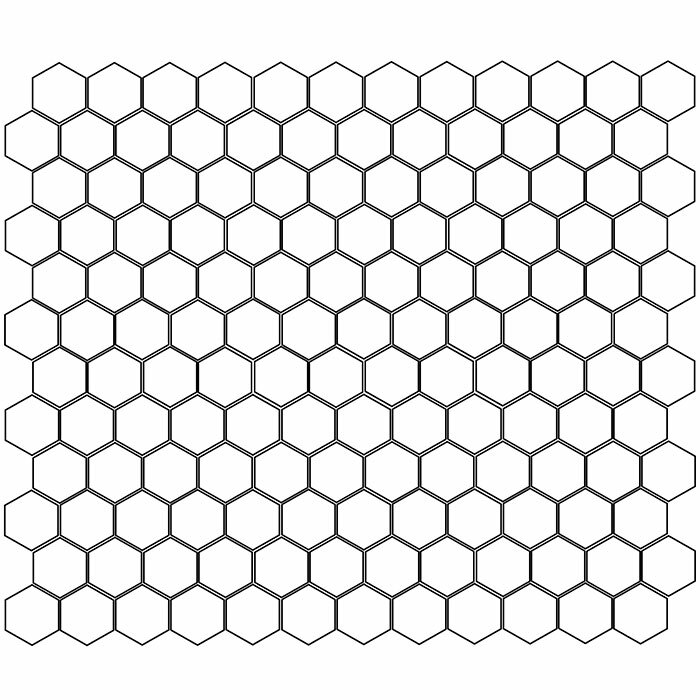 The question is about a game played in a hexagonal grid. To cut a long story short, my opinion is that the test is highly inappropriate. In this blog post, I will focus on the study of question 11. Even though I have not really understood this question, I promise you, dear reader, that if you are patient enough to read this blog post, I am sure that you will find it useful nonetheless. Question 11 is about a fictional game: Quess (I guess the name is coined so that it roughly reminds us of the game of chess). 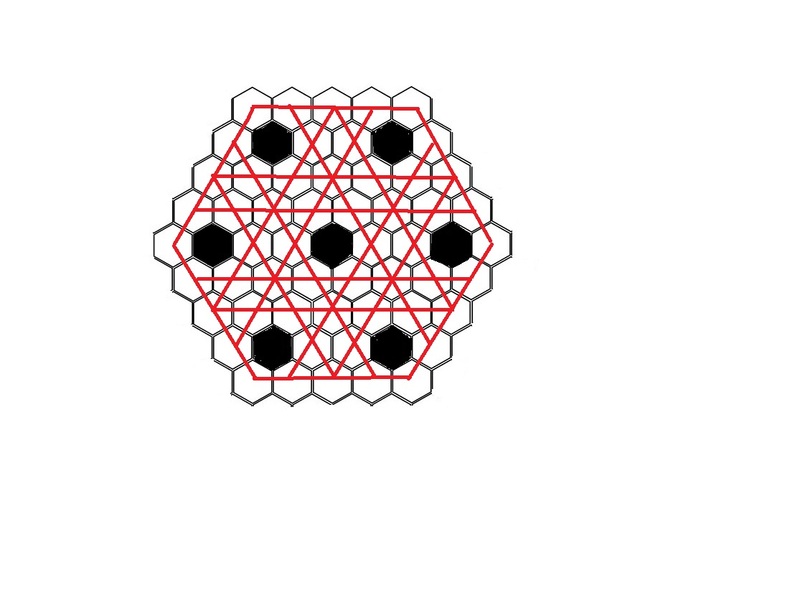 Quess is played on a specific hexagonal grid. In Quess, there may be many kinds of pieces, but we are informed about two of them: Warriors and Warp Gates. From now on, I will denote Warriors as red circles (disks) and WarpGates as blue circles (disks). Warriors may move up to seven spaces (hexagons) in a straight line, unless they encounter a WarpGate, in which case they warp to another WarpGate and continue their path in the same direction. WarpGates may move up to one space (hexagon) in any direction. We are asked to find the minimum number of WarpGates that allow only four Warriors to attack the entire grid. When a Warrior encounters a WarpGate, the Warrior has to warp to another WarpGate. But can the Warrior choose which WarpGate it should warp to? Of course, if we use up to two WarpGates, this question does not apply. But what if we have more than two WarpGates? The rest of this blog post will assume that the Warrior is able to choose which WarpGate it will warp to. We would like to use four Warriors to attack the whole grid. But why? Only one Warrior can attack the whole grid just as fine. A single Warrior can move only in a straight line. Once it stops, it can then move a gain to a different direction, thus visiting the whole grid. Do we want to have four Warriors, so that whatever space (hexagon) in the grid we choose, it can be immediately attacked by just moving one of the Warriors only once? The rest of this blog post will assume that. 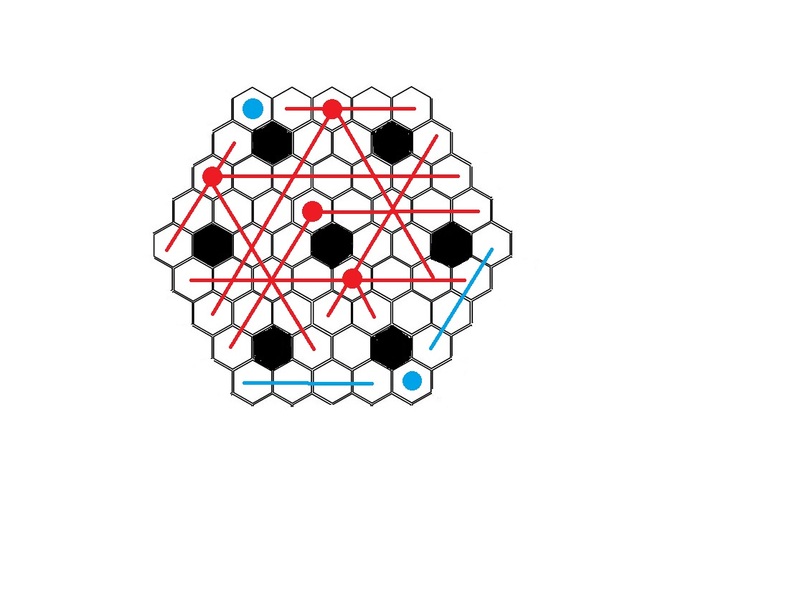 If we assume that we want to have four Warriors able to reach any space (hexagon) in a single move, and we want to place the least number of WarpGates to achieve this, why does the question state that each WarpGate moves by only one space? Are we going to be moving WarpGates? 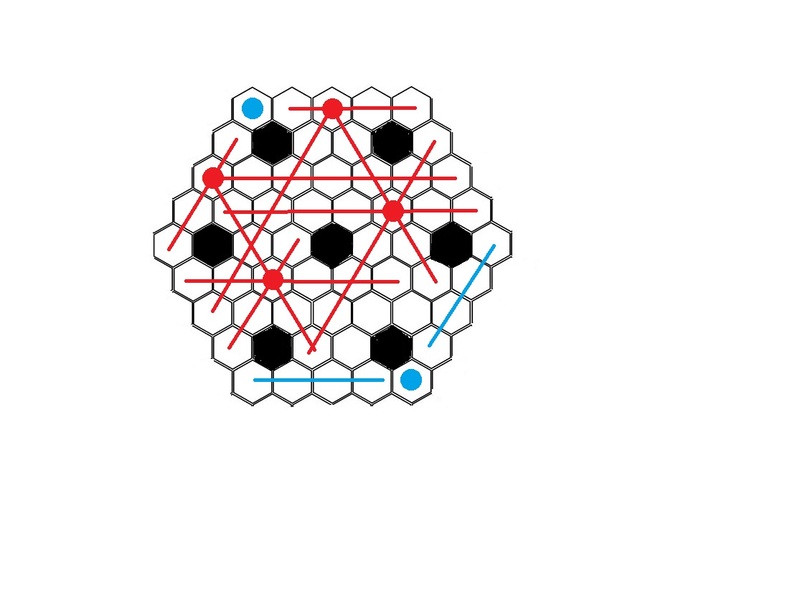 The rest of this blog post will assume that we will place four Warriors on the grid, trying to have them reach any one space (hexagon) in a single move. We will place the least amount of WarpGates in order to achieve that and we will not move any Warp Gate. Now, the question states how each WarpGate moves, but why it does so is a mystery to me. So, perhaps I have not understood the question. So, in the rest of this blog post, I might be solving the wrong problem. 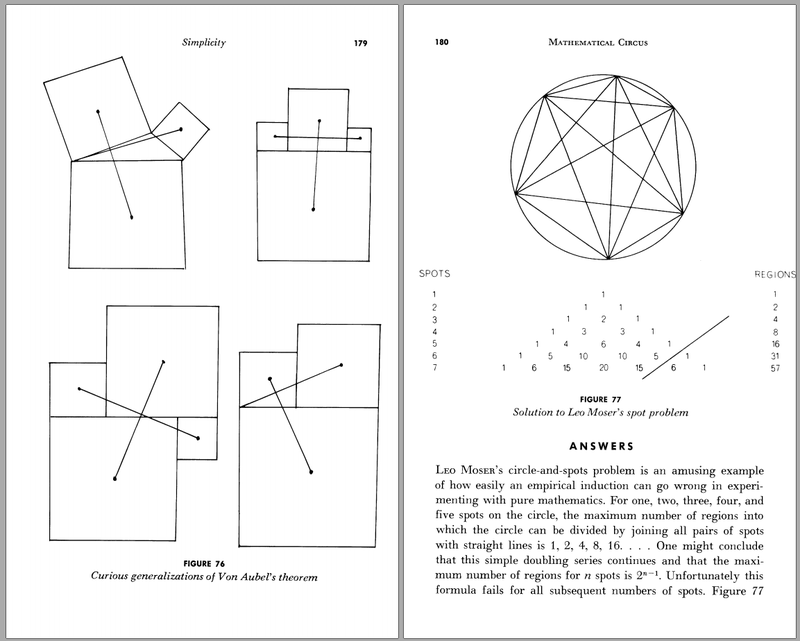 For the following discussion,I found the following hexagon grid from Pratt & Larson. I used the above grid to create the following Quess grid. 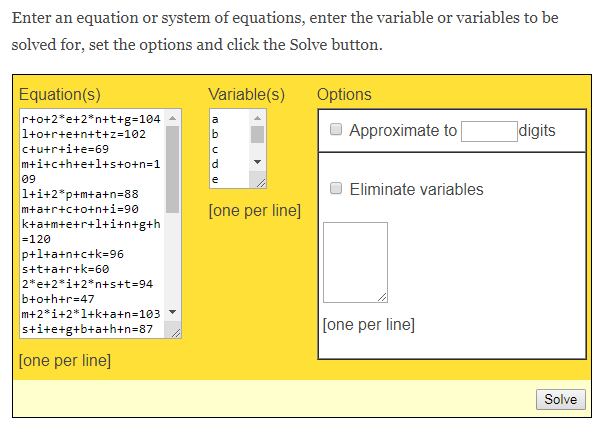 You can use this Quess grid to try to solve the question. The first thing I did when I created the Quess grid was to study it. For this, I drew straight lines, arriving at the following image. Please note that the following image contains no Warriors or WarpGates, just straight lines that can be drawn. This image helped me understand the way Warriors move on the grid. From then on, I began to solve the problem. Keep in mind that I might be solving the wrong problem, since I have not understood the question. Also, please note that in the following images, red circles denote Warriors, blue circles denote WarpGates, red lines denote paths a Warrior takes and blue lines denote paths a Warrior tales after it emerges from a WarpGate. Red paths (lines) always begin from a red circle. Blue paths (lines) always begin from a blue circle. In addition please note that, in order to not clutter the images, I do not draw many parts of the red paths (especially if the hexagons where the paths lead have already been covered by another path) and I do not draw many blue paths. I do not draw only all lines and I do not draw them to their full extent. This way, it is easier to see the logic. So, the first attempt I made is the following image, where there are four Warriors and they cover the whole grid except 6 hexagons. Now, if we place a WarpGate in each of these hexagons, then we have the whole grid covered with 6 WarpGates. But these 6 WarpGates are not used for warping, since they are not reachable by Warriors. These 6 WarpGate are only used to fill hexagons. Are we allowed to do that? That’s another question. Moving on, the following attempt uses 2 WarpGates, but leaves 3 hexagons uncovered. May we fill them with more WarpGates? 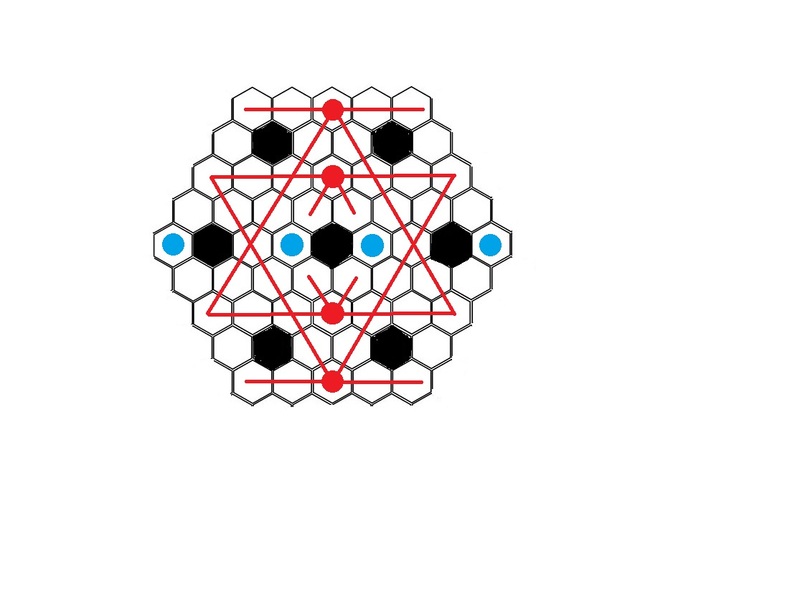 The following attempt still uses 2 WarpGates, but leaves 2 hexagons uncovered. Better, but not adequate. The following attempt uses 4 WarpGates. Here, the whole grid is covered and I present this as a solution. If the Warrior from above enters the middle left WarpGate, it will warp to the right WarpGate and continue downwards. If the Warrior from above enters the middle right WarpGate, it will warp to the left WarpGate and continue downwards. If the Warrior from below enters the middle left WarpGate, it will warp to the right WarpGate and continue upwards. If the Warrior from below enters the middle right WarpGate, it will warp to the left WarpGate and continue upwards. So, with 4 WarpGates, we have covered the whole grid. Can we do it with less? I am not certain. I doubt that it can be done with 0 WarpGates. What about with 1 WarpGate? Well, once a Warrior enters a WarpGate, it has to emerge from another WarpGate and not the same. So, if there would be a single WarpGate, it would have to be unreachable to the Warriors and it will be used just to fill a hexagon. What about with 2 or 3 WarpGates? I cannot exclude this possibility. All I was able to do is to solve the problem with 4 WarpGates and the solution is in the image above. Of course, as I have already mentioned, I might be solving the wrong problem. Now, this is one of the many questions in the test that the test taker can find the answer without understanding or solving the question, thus gaming the system. The test taker can answer 0, then 1, then 2 and so on until the system rewards her. I guess this is why the creators of the test say that the average person answers less than two questions correctly. They look at the answer submissions. But these submissions are made frantically from people who try to game the system to reveal the answers. So, a person would submit again and again, giving purposely wrong answers to all questions except the one she is trying to guess. This way, using the system as a oracle, she can deduce the answer to many questions that do not have a free form. And most of the questions do not. So, the system can be gamed easily. What the creators of the test witnessed when they reviewed the submission logs were not honest attempts by average people but coordinated attempts by people who were gaming the system and were successful at that, as well. Each attempt had as target to find the answer to only one question, thus all other answers were purposely incorrect. To the creators of the test, this seemed like the people that were submitting were trying but could only get one correct answer at most. The creators of the test got the wrong impression, because they thought that the submissions in their logs were honest ones. Little did they know that a large number of test takers succeeded in gaming and abusing their system. At least, that’s my theory. When the system was live I knew nothing about it. I never used it. So, I can only speculate as to how it worked and how the submissions of the answers were made. Anyhow, I do not like the fact that I tried to answer this problem (question 11), only to find that I had questions about it and no one to answer them. And I do not like the fact that the answers are not provided. Knowing but not telling: I find it to be a childish behavior. In this blog post, I will study Question 3 from this test. The question is about the maximum number of regions that a circle can be divided if we draw chords connecting points on its circumference. To cut a long story short, my opinion is that the test is highly inappropriate. In this blog post, I will focus on the study of question 3. Well, any question from this test leaves me speechless, but this is not a compliment to the test. I find that the test is pointless, tedious, unintelligent and lacks explanation. I cannot get it. I cannot understand it. I do not know what to say. I am speechless. Here we have this question. Question number 3. What does it want from us? Well, it is very clear what it wants. 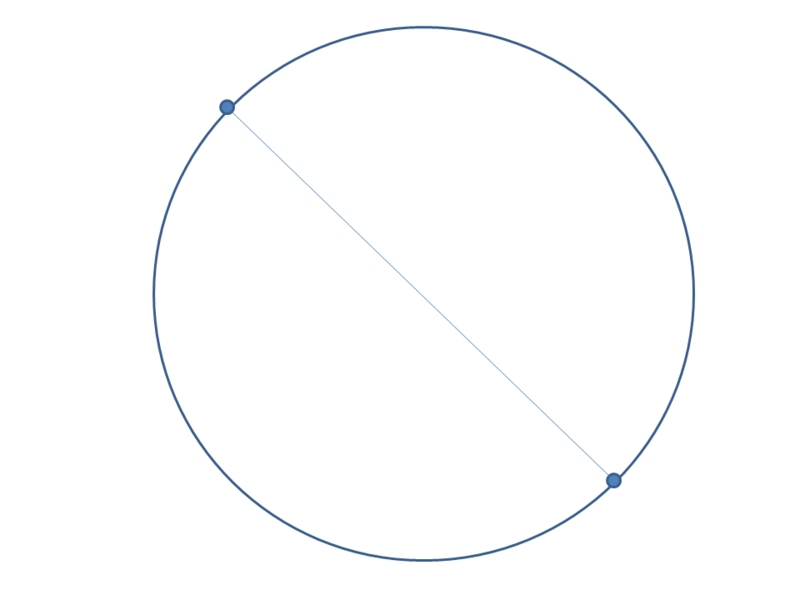 I wants us to find the maximum number of regions that are created when there are seven points on the circumference of a circle and we connect them with straight lines. It is a nice problem and a known one, with a known solution. Since the authors of the test want it to maintain its integrity, why pose a well known problem? Points for originality: Nada! Since the authors of the test want to test intelligence, why ask a question that in this blog post I will prove that a toddler can answer? Points for intelligence: Nada! What is the purpose of such a question in a test for high intelligence? Points for sense and sensibility: Nada! When I try to solve a question from the test, I feel to encounter two S’s. Solitude and Stupidity. Am I the Sole person who thinks that this test is Stupid? Before we go any further, I would like to repeat that is a well known problem with a well known solution. I do not where to begin, because this problem can be solved by a toddler, but more on this later. First of all, this problem is discussed in the Martin Gardner’s book “Mathematical Circus”. Below I present the pages of this book that pertain to this problem. Also, at the end of the book there are references pertaining to this problem. 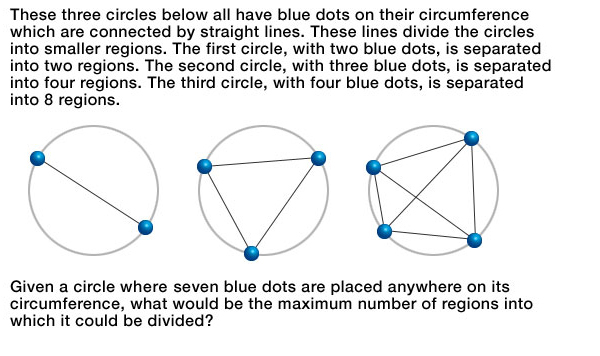 There are quite a few questions from this exam that are depicted almost word-for-word in Martin Gardner’s books. As I said: Points for originality: Nada! I will let the reader decide who is the unoriginal: Martin Gardner or the authors of the test. At least, Martin Gardner names his sources! 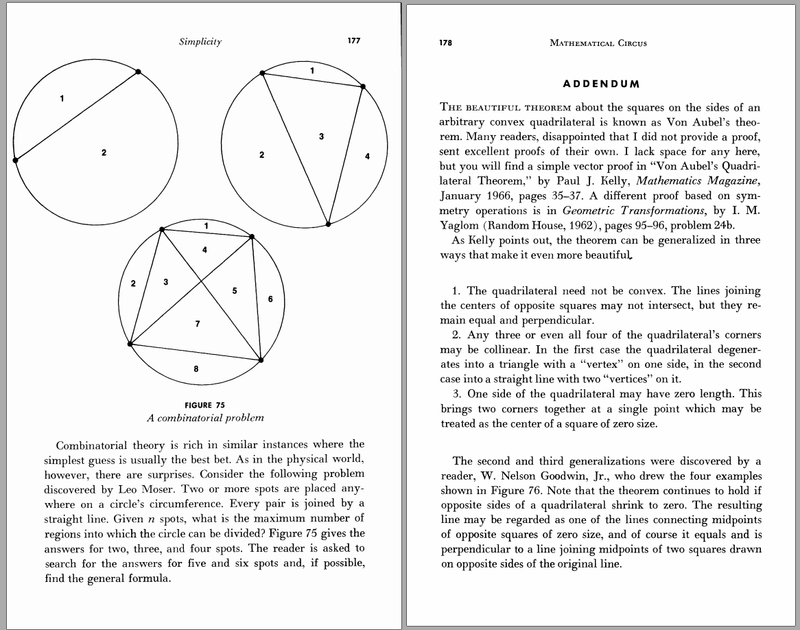 So, here is the material from Martin Gardner’s book. Below, I present two links that provide the solution (and the rationale behind it) to this well-known and well-studied problem. But this problem can be solved by a toddler as well. The toddler may not be able to provide a general formula, but she will be able to count the number of regions. To prove to myself that a toddler could do it, I put myself in a toddler’s position. Although I did not crawl on all fours, (do not be surprised, that would be ridiculous for anyone else, but not for me! ), I drew the relevant shape and counted the numbers of regions. Below, I present all cases from 2 points on the circumference up to 7 points on the circumference. Obviously, since we want the maximum number of regions, care has to be taken that each crossing point is made by only 2 lines. If 3 or more lines pass through a crossing point, this means that 1 or more regions are collapsed to this point, so we do not have the maximum number of regions. I drew each shape in PowerPoint. As I drew each line (chord), I would count it, so that I knew how many lines there were, even if the question did not ask for it. Then I opened each image in Paint. I took the area painter (the bucket) and started clicking inside each region, thus counting them. Each region I would click and count was colored by my click, so I knew not to double count it. And I did not stop there. When I had counted the regions by coloring them with the same color, in the colored shape the lines and the intersection points were still shown. So I took the eraser and I put a little erasing smudge on each intersecting point, thus counting the intersecting points as well, even though the question did not ask for it. I created the following table which depicts my results. “Points” are the number of points on the circumference. 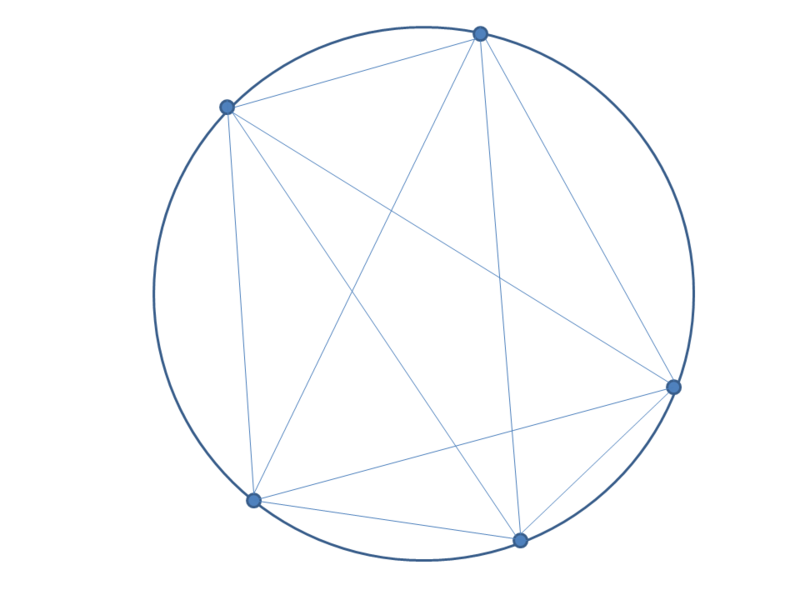 “Chords” are the line segments, where each line segment is drawn between two of the points in the circumference. “Crossings” are the inner crossings, the crossings where two line segments cross inside the circle. 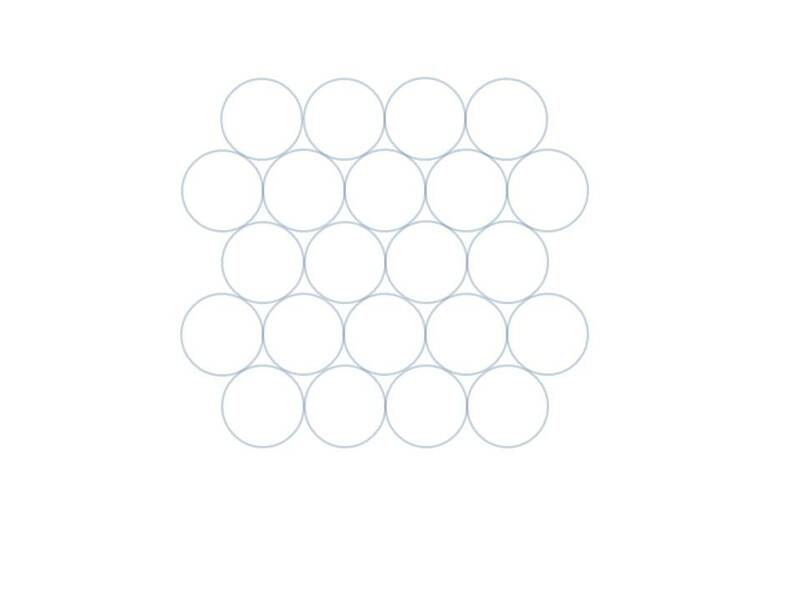 “Regions” are the empty areas that are formed inside the circle, “empty” meaning they contain no lines inside them. The above table shows that the answer to the puzzle’s question is 57. Let us see how we can generalize our findings. The following analysis is widely known to all mathematicians and also physicists like me know this theory very well. Dare I say, all students know this theory very well? But this measures knowledge or intelligence? I say that it only measures knowledge. Anyway, the test question only asks for the number of regions, so the answer is 57 and that is all. By merely counting the regions we arrived at the answer. First of all, let us denote the number of points on the circumference with the letter n. This is the column named “Points”. In order to have the maximum number of regions, each point is connected to each other point with a chord. To find the total number of chords, we can think in one of three ways. First way: We have n points. Each point is connected with each one of the other n-1 points. So we have n*(n-1) lines (line segments). But in this number, we have accounted for each line twice, from the perspective of both points in each line. So we have n*(n-1)/2 lines. (n choose 2) = n!/[2!*(n-2)!] = n*(n-1)/2. (n – 1) + (n – 2) + … + 2 + 1 = n*(n-1)/2. So, the formula for the column named “Chords” is (n choose 2) = n*(n-1)/2. Now let us find the formula for the column named “Crossings”. For 2 lines to create a crossing, the 2 points of one line have to be different than the 2 points of the other line. In other words, to have a crossing, 4 different points on the circumference have to be involved, two of them defining one of the lines and the other two defining the other line. This concept is easier to grasp if you look at the shape I provide for the simplest case. 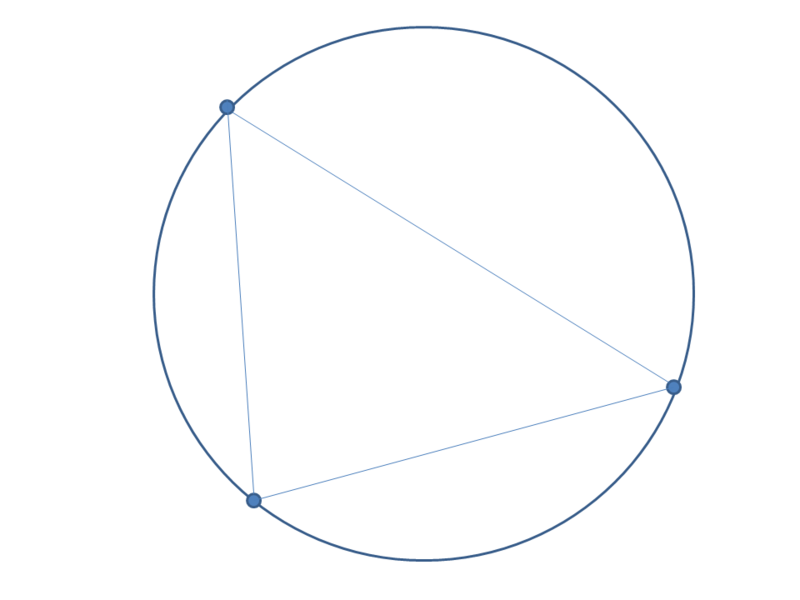 This is the shape with 4 points on the circumference which corresponds to only 1 crossing. 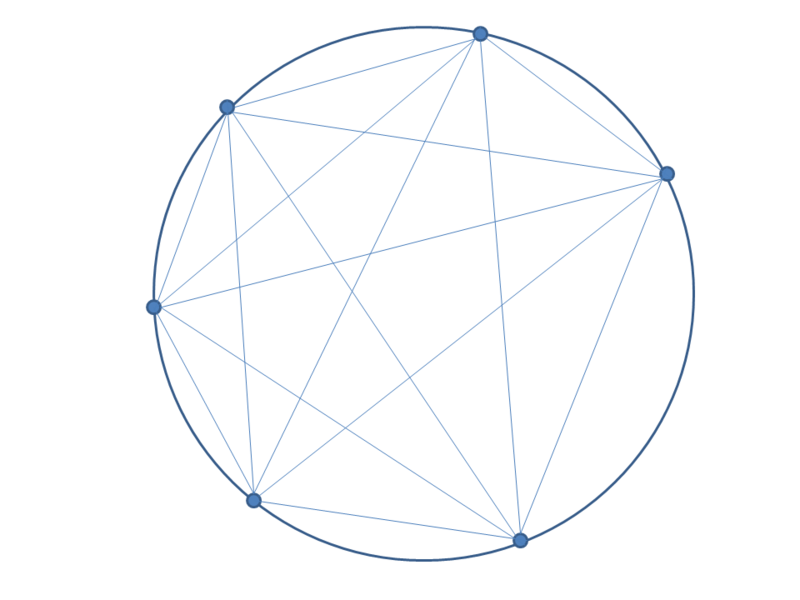 This sole crossing exists because the 4 points on the circumference are 4 different points. Any 4 different points define two lines and 1 crossing. Thus, the formula for the column named “Crossings” is (n choose 4) = n!/[4!*(n-4)!]. Now let us find the formula for the column named “Regions”, which is what the puzzle describes as regions. The Wikipedia article I mentioned above rigorously describes the different approaches that explain and provide the corresponding formula. Because someone, like me, may lose themselves in mathematical rigor, before reading the full rigorous explanations and proofs, it is best to have a high level overview of them. So, as an introduction to these rigorous proofs and explanations, I would like to give a simplistic overview. Imagine (you don’t have to imagine, you can actually draw what I describe) that we have the circle and nothing else. So, we only have 1 region, which comprises the full circle. Then imagine that we draw parallel lines. As each new line is drawn, another region is created. Now imagine that the lines we already drew start intersecting. As each intersection (crossing) occurs, another region is created. 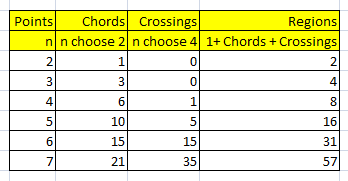 1 + Chords + Crossings = 1 + (n choose 2) + (n choose 4). So, I can present you with the following theoretical table which coincides exactly with the empirical table I gave you above.